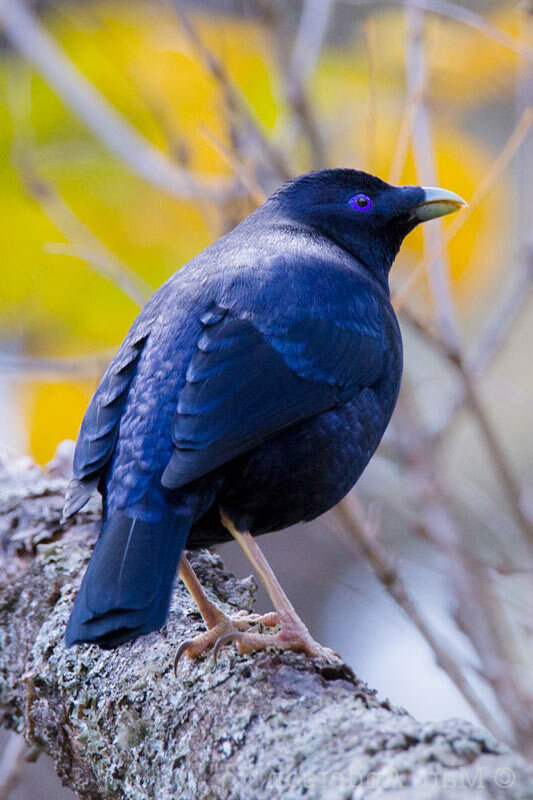 The Satin Bowerbird (Ptilonorhynchus violaceus) is a chunky, medium-sized bird found in forests along the east coast of Australia. 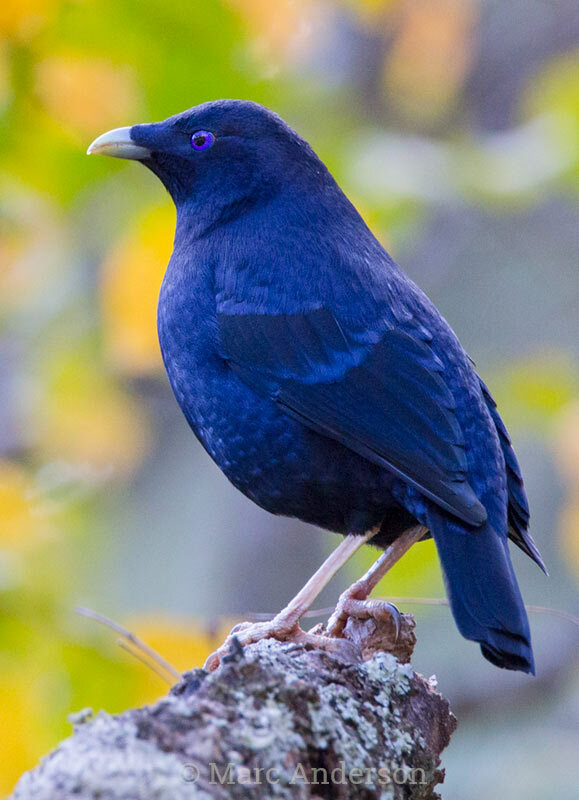 Adult male Satin Bowerbirds have a stunning, shiny deep-blue plumage which can appear plain black at first glance. Females and immature males are predominantly ashy green and olive on the upperbody and scalloped green and buff underneath. Both sexes have striking violet-coloured eyes. 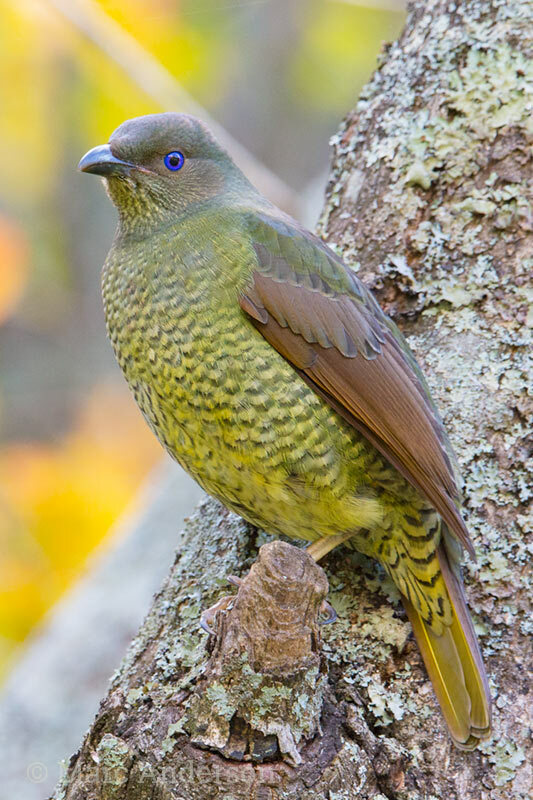 Like other members of the bowerbird family, Satin Bowerbirds exhibit complex courtship behaviour. This species builds an avenue-type bower and decorates it with carefully selected ornaments, preferring items which are blue or yellow. 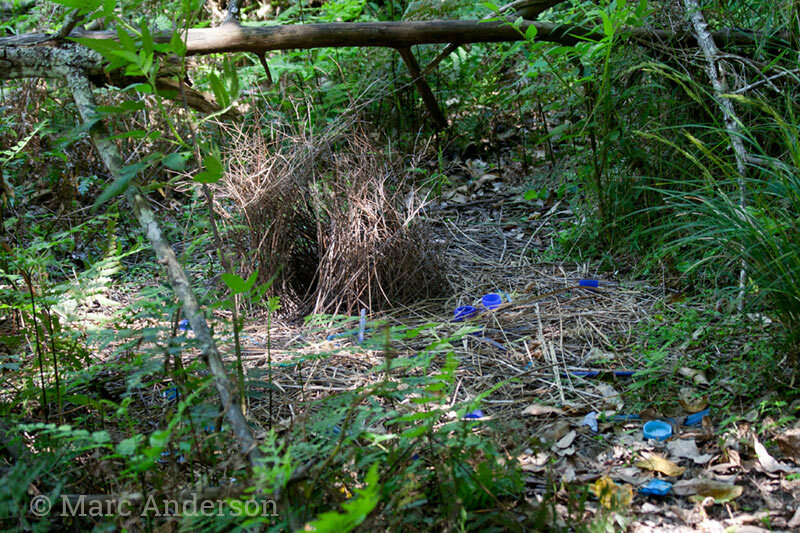 In bowers near human habitation, blue plastic straws and plastic bottle lids are often the most common decorations. XC201468 This first sample features typical whistles, buzzes and squelches from a Satin Bowerbird. Recorded in Wollemi National Park, New South Wales. XC174171 This is a brief example of a single, descending whistle. This is sometimes repeated as a series of two or three similar calls as in the next example. Recorded in the Royal National Park, New South Wales. XC377807 This is a further example of the loud, descending whistle – this time two whistles are given close together, followed by another at 0:17. Recorded at Barren Grounds Nature Reserve, New South Wales. B05h12m02s This recording is the display song of an adult male Satin Bowerbird at the bower. Normally this fast, repetitive, mechanical call is preceded by a long series of strange squeaky notes and churring calls (as in the following example), but the main part of the song was extracted so it could be highlighted here. Recorded in Barren Grounds Nature Reserve, New South Wales. XC171965 This is another recording of the display song. In this sample you can hear the series of squeaky notes and churrs leading up to the fast part of the song. Recorded in Barren Grounds Nature Reserve, New South Wales. XC377805 Another commonly-heard vocalisation – this is an example of the harsh, rasping call. Recorded in Barren Grounds Nature Reserve, New South Wales. XC377806 Somewhat similar to the previous example, these are short, raspy calls with a more whistled quality. Recorded in Barren Grounds Nature Reserve, New South Wales. XC377808 This is an example of a call of the northern subspecies Ptilonorhynchus violaceus minor. This taxa is found in the upland rainforests of far north Queensland. Recorded in Mount Hypipamee National Park, Queensland.